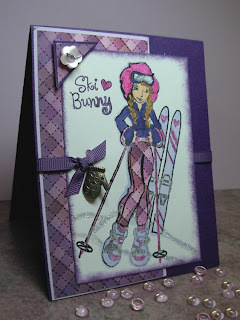 Can't get enough of the SKI BUNNY!!!!! 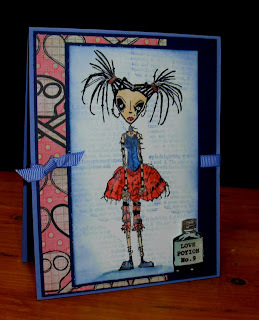 I created this card for the Hanna Stamps Embellishment Challenge. 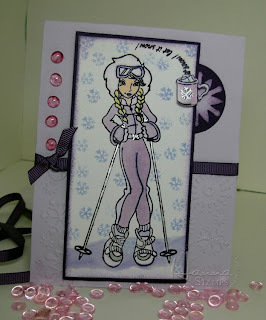 You need to use at least two embellishments on your card...............See the sweet pewter mitten?? Kristi carries those in the Hanna Stamps Store. Head on over to the Hanna Member Forum to play the challenge. You could win a stamp set of your choice!!!!! I paper pieced Hanna's Ski Pants with some COOL paper that I received from a couple of lovely ladies from England when I was at CHA Chicago. Don't forget to leave your comments. I am going to draw from all the comments on my sneak peeks for a yet to be released Sophie or Riley Moose!!!!!!! Have a great day ladies............................... I am burnin' the midnight oil again and I am sure it will catch up soon. Tune in for more sneak peeks tomorrow!!!!! Got a Sweet tooth????? I have BLOG CANDY!!!!!! Yes............. BLOG CANDY............. sweet sweet sweet!!!!!! 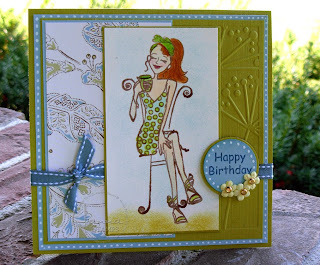 Hanna Stamps is Celebrating ALL week long...........with Great Challenges, Giveaways and Blog Candy from each Design Team Member. 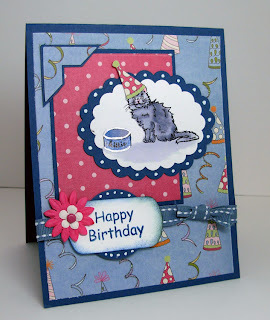 Blog Candy Right Here.....Oct 5th will be Hanna Stamps 1 year anniversary. We want to celebrate this great event with you! Every design team member is having this blog candy. Leave a comment on all of our blogs for an increase chance to win. What's better than chocolate mousse???? New Riley's of course!!!! Visit our talented Design Team Blogs between Monday and Wednesday to see exciting sneak peeks and for the chance to win a never seen before Riley/Sophie Moose Image. Here is the link to the design team. One new stamp per Design Team member blog will be given out. Winners will be announced at the Hanna Stamps Release Party on Thursday October 2nd at 9:00 p.m. So pop into the party for challenges, prizes, chatter, more prizes and to see what the amazing Design Team has in store for you. So for MY BLOG................. Leave a Comment on ANY of the Hanna Sneak Peek Posts that I put up between NOW and THURSDAY at 4 p.m. est! I will then compile all the names and announce the winner at the release party on Thursday evening. In addition, I will post the winner here as well. Hop on over to the Hanna Member Forum and do play the challenges this week. You have a great chance to win some fabulous stamp sets!!!! Isn't this little guy just a cutie patootie??? Is THAT how you spell patootie???? tooty???? hmmm , oh well! I think he is cute..................a cute little swashbuckler. Anyway..................... I am sure some of you must read my stuff some time and wonder where the screws went..............lol......... guess that's just all a part of my silly personality.............ya have to get through the "schtick" to get the goods!!!!!!! I created this little card for the Hanna Friday Challenge. 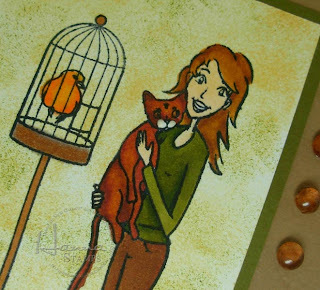 Hop on over to the Hanna Stamps Member Forum and see what Kendra has in store for you this week. There are some very cute projects from our DT in there! I was THRILLED................ well not Thrilled........MORE than THRILLED.......... yes WAY WAY WAY more than THRilled..... well actually you know that you are more than Thrilled when you start your emails off with "WHEEEEEEEEEEEEEEEEEEEEEEEEEEEE!!!!! and the receiver of the email may also know that you are more than thrilled, or that you are sliding down a bannister as you type (thanks JEANNE!) or that you are simply NUTS!!!!!! I confess, I am NUTS for Stampotique stamps! So when I received a big box of Rubber yesterday, I was doing a cartwheel............ yes! New rubber is BETTER than chocolate....................although you can't eat it, it is better..........really,,,,,,,,, it is...........hmph.... well it's at least as good. It didn't take me long to get some rubber to paper and start colouring some of the great images that I have and that I will share with you over the next little while. I should be able to do that, I earn my living TEACHING those skills............. Anyway, I just repunched the flower with a smaller punch and VIOLA! It fit just poifect! I can't wait to play with more stamps today...........................Also, we have a new Hanna Release coming up next week, so watch for some great sneak peeks then!!!! I love these macabre little fellows!!!! I used DP from the Rock Star Mat Pack as a base for my cards. 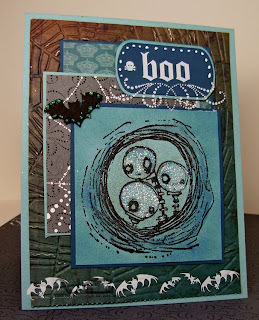 I Cuttlebugged the bottom layer with the Spiderweb embossing template. The small grey and white layer is from the SU Halloween Designer Paper. I stamped the main image onto Baja Breeze paper with momento Tuxedo Black ink. I used and aqua painter to pick up some ink from the Not Quite Navy ink pad to add shadows around on on the sweet little heads! I sponged baja Breeze around the main image and then glittered the heads with dazzling diamonds glitter. Stampin' Up! 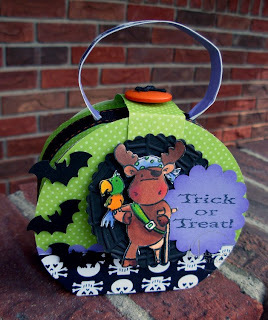 Halloween Rub ons and a Martha Stewart Bat complete this non traditional Halloween Card. I love the days when I am home and can play the Splitcoaststampers challenges. The Colour and Sketch Challenges are my Favourite! Its interesting to see the huge differences you can see in the artwork, despite the fact that everyone is using the same colours!!!!! For this card, I used the Cafe Hanna stamp along with Hanna's everyday sentiments. I stamped the card with Momento Rich Cocoa ink and coloured with copics to compliment todays colour challenge, which was Kiwi Kiss, Baja Breeze and Vanilla. I found some matching DP by K&Co. 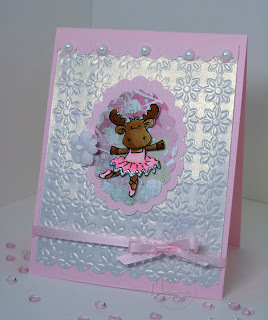 Vanilla coloured Prima's add a little pizzaz to the card. If you don't play already, give the challenges a try. They allow you to expand your creativity while belonging to a community of great people who love what you do too!!!!! I LOVE lazy Sundays............. the kind where you just lay in bed and relax...........trying not to worry about the kazillion tasks that are on your to do list, just enjoying the listless feeling that you can laze around and allow yourself to be in denial about the reality of life catching up and taking over!!!!! So this morning, I allowed myself to drift in and out of sleep until around 10 a.m. Think this is a good practice and I am going to strive to do that more often!!!!! 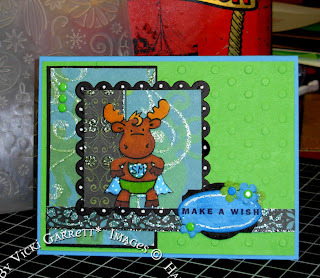 I created this card for our Friday Challenge over in the Hanna Member Forum on Splitcoast stampers. This is another image that Jonathon had all coloured up for me, so all I had to do was trim him and figure out how I would showcase him on the card. 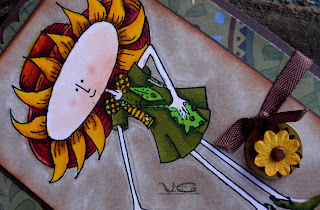 Jeanne Streiff, our challenge hostess, posted a very cool peice of fabric as a means of inspiration. So mainly, I took the bright colours as my inspiration and then tried to choose a DP that would mimic the colours and circular pattern. I used the sentime from the So cool set as a base to suspend my surfin' Reilly. Cuttlebug embossing template to add some dimension and flowers, brads and stickles for pizzaz!!!!! Hey!! Did you know that Hanna Stamps will be a year old soon!!!!! Starting NEXT week, you will have the opportunity to win some great Blog Candy..........never before seen Riley/Sophie images, just by visiting the DT's Blogs and leaving some comments. The very source of inspiration for Hanna Stamps.............. "THE" real Hanna is celebrating a Birthday today!!! Hanna, Jonathon and I are wishing you the best birthday ever!!!!! We hope your day is full of fun and sweet surprises.............have a piece of Cake for us!!!!! I was hoping that you will get your card tomorrow, but if not, this is the virtual version! I made this card by Suspending the Main image from Best Friend onto a large SU initial stamp. HSC34-Super Riley and a Super Helper! 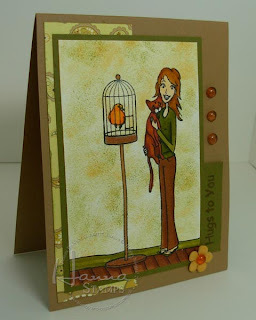 This card was created for the Hanna Stamps Friday Challenge, hosted by one our talented Design Team members each week. This week Featured Shannon, with a great sketch Challenge. I now officially have a helper who likes to colour images, particularly Riley. Jonathon has coloured up several Riley's for me and if I don't say so myself, does a pretty darn good job!!!!!!! This makes card making SO much easier.......don't get me wrong, I like to colour just as much, but having images to work with in a pinch, makes things move a long quickly. 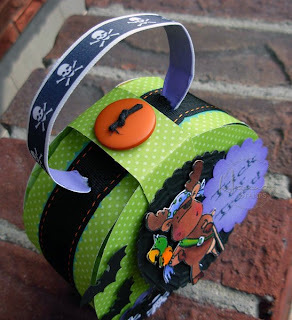 I used Green Galore, Tempting Turquoise, Basic Black and DP from DCVW all dressed up stack. Following the sketch, made this card come together quickly and easily. Prima Flowers, White Gel plan and SU bold brights brads finish it off quite nicely. Happy Sunday...................now I'm off to enjoy a lazy day!!!! 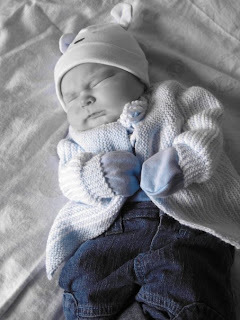 This little cherub is the latest addition to my extended family. Wee Bryson John was born September 8th at 8:08 a.m. weighing in at 8lbs, 8 oz. If the stars are accurate, this is one lucky little fellow!!!!!! I remember (well it's a good thing that I am not so old that I haven't lost my memory) when his father was the same age. Being a teenager at the time, Jeremy was my favourite little guy and I got the opportunity to babysit him. He was the sweetest little boy and I just loved spending time with him. Hard to believe that he has grown up and has a son of his own now. Wow! time has a way of just running by you. This is my Uncle John and Aunt Dot. 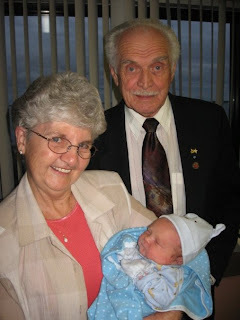 Very very proud Great Grandparents. And of course, a special card for a special little guy. 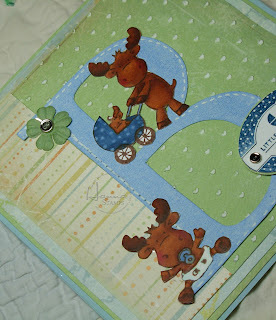 I used images from Riley Moose as the Focal point for my card, colouring and suspending them on a SU! initial stamp. I love the Big Letters. They make a great background. The paper is from Crate Paper, with Bashful Blue Cardstock. The images are coloured with Copic Markers. White Gel Pen, Prima Flowers and Memory Makers Button Brads complete the layout. I wish Nicole and Jeremy many happy days with their new little one and can't wait to see him change and grow. I don't think I would open until Christmas if she told me not to!!!!! 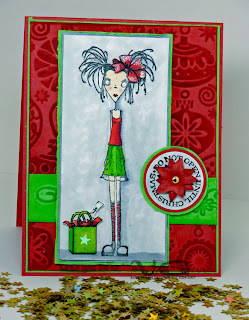 I created this card for a splitcoaststampers colour challenge yesterday. This is Sheer, another fun and funky image available at Stampotique (click on my sidebar link, that will take you directly to the site!) I can't get enough of Daniel Torrente's Gothic Style Girls and characters. 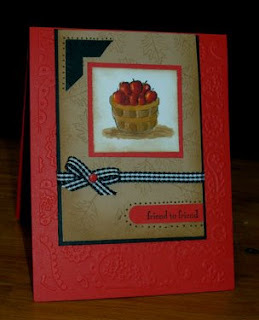 I used a cuttlebug embossing folder to create the background for the card. To deepen the look of the embossing, I rubbed a Riding Hood Red inkpad over the entire card back until it picked up the ink on the higher parts. The Bag and Bow is from the Hanna Stamps perfect present set. the sentiment from Stampin' Up! Can't find that perfect patterned paper to match the theme of the card you are making...............need a quick (well, maybe not so quick) solution??? This is one of the reasons that I love stamps that can be purchased in sets. It allows you to use the accessories to create a patterned paper that precisely matches your main images. 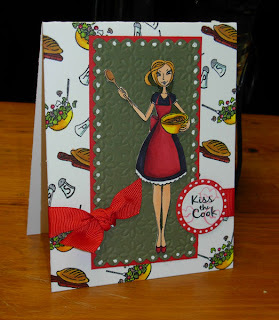 I created this patterned paper by using the Bread, Salt Shakers and Salad Bowl stamps from the Kiss the Cook set. Although I stamped the images separately, the beauty of acrylic stamps are that you can combine them on a larger block to save yourself some time. I love the bright and fresh look of this card. Artichoke and Red offsets the brightness of the white background! All images are coloured by Copic. This Prom queen looks like she could use a little Love Potion!!!! Another great image available at Stampotique!!!! Was kind of feeling a little like her this morning when I first got up. Wishing my hair is longer so I could throw it up in a ponytail...............hmmmmm have to remind myself that lazy weekends can't always be extended into mondays! There are lunches to be made, hair to be ironed and clothes to be donned. There is nothing better I'd like to do that sit at my computer this morning in my towel, my wet hair a mop and cruise blogs.........but alas there is also a paycheque to be earned............. so off I go! I created the background by stamping the Spirit definition off twice before I stamped on the paper and then drawing in the ink to the image in a circular motion. The Love Potion image was stamped in black, shaded with cool shadow copic and coated with some crystal effects for pizzaz!!!!! 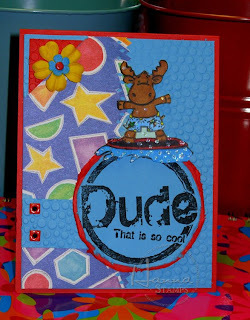 Apart from making this card, which incidentally was due on Friday (hehe) I have done absolutely nothing........yep NADA, ZIP.............ummmmm well maybe watched the dust bunnies play under my coffee table.......slept through two movies....and well....... I did manage to get some laundry into the tub, but I have yet to change it. Very seldom do I relax, but since my visit with Kristi and Jacqui, I have been doing an awful lot of that. Lazy bones I am. To be truthful, I am quite enjoying it. Having juggled my full time career, with parenting, Stampin' Up! and teaching in up to three locations, I rarely could find a time where I could just chill out without ruminating about what I should be doing. I made a very difficult decision last week, however in my heart, I know that it is the best one for me. 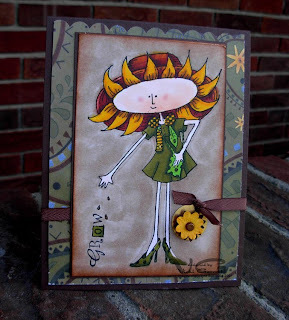 I have decided to give up my Stampin' Up! Business and Teaching and concentrate on designing and posting on my Blog. I really enjoy writing and hope that time will allow me to express myself freely and perhaps torture you all with my thoughts and insights..................well at least I hope I don't put you to sleep!!!!! lol.... I have been called lot's of things in my day, but I don't think I have ever been called boring. So I will be here, designing and writing, writing and colouring, sprinkling things with glitter and doing what my heart tells me to do and I hope you will continue to be here with me!!! Isn't this Sophie just the sweetest tiny dancer?? This is a special edition Sophie and I have copied a exerpt from Kristi's Blog explaining all of the details. As most might have noticed, that we are having a Ballet Sophie G being released this Friday along with 4 clear sets. A while back, Daisy from Eclectic Paperie ask if I could make or had any images of Riley doing ballet. I told her that we did, and she asked if I would make this image into a stamp for her friends daughter named Kelly. She went on to explain to us that Kelly was diagnosed with a grade 4 glioblastoma multiforme (brain tumor) in July, 2007. She had surgery to have the tumor removed at Children's Hospital of Orange County in Orange, California. After one round of radiation and chemotherapy, she had another surgery to remove a recurrent tumor on October 22. She is receiving further treatment to try to prevent another recurrence. So with this stamp we at Hanna Stamps and Eclectic Paperie will be donating a portion of the proceeds from the sales of this stamp to her foundation. So please help us help Kelly fight her cancer. We will be offering this stamp in unmounted and mounted. Eclectic Paperie and Hanna Stamps are the only 2 stores that will carry this stamp. This stamp will not be made available any where else. Thank you again for any and all support. Don't you just love fresh apples. As I wrote the title this morning, I can almost smell that sweet tart aroma of McIntosh Apples. I grew up in a very small village, where apple farming was predominant. I remember looking forward to going back to school, because it always meant a trip to one of the local orchards. We would run up and down the rows of trees and stuff ourselves with the crisp juicy apples until our tummies hurt!!! Then we would learn how apple cider is made and of course get to sample the sweet drink. This image is from the new Hanna set Jump for Joy. I will post a card made with the main image later this week, but I have to tell you, the basket of apples was the first image I jumped to use. Well, I am running late (what else is new??) so I best get on my Way!!! Don't forget to join us this evening in the Hanna Stamps member forum at 9 p.m. est. It's going to be lots of fun!!!! 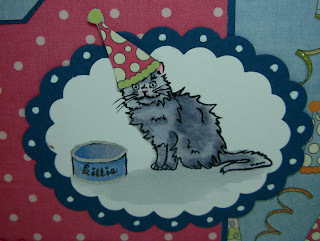 Kitty in a Party Hat??? Honestly.....well actually, I have a few pictures of my Husky in a Birthday hat!!!!! This is a sneak peek from the Hanna cat set, that will be released on Friday. for chatter, challenges and prizes!!!! Don't forget that Kristi has a great special on for the month of September. Visit the Hanna stamps website for the details. I made this card with Imaginisce Designer Paper. I couldn't resist cutting out one of the little hats for kitty's head. Do you suppose he is REALLY drinking milk?? I stamped the kitty with Momento ink in Tuxedo Black. I have been in HEAVEN since I got this ink. Stamps Clean and easy!!!! I coloured the kitty with COPIC Markers and then punched out the image with my Marvy Scalloped ovals. The sentiment is also a Hanna Set. I punched Happy Birthday out with the Key Tag punch and layered it over a 1 3/8" circle. A little stiched ribbon and a couple of Primas and my card was complete!!!! Hope to bring you more great sneak peeks tomorrow! Do I have a treat for you!!!! If you love the Goth Girls that I have posted or these little macabre fellows you see today, you will LOVE lOVE lOVE the new Holiday images. I can't wait to get some of that rubber in my hot little hands and fast!!!!! 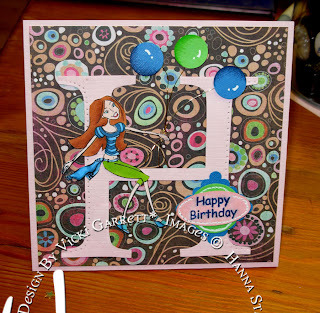 This card was created with the 3 in a round stamp by Daniel Torrente. First, I stamped the image on black cardstock with versamark and embossed with silver powder. I cut the middle of the image out and distressed the inner and outer edges with a distressing tool. I stamped the honeycomb background, also available at stampotique onto the green galore cardstock, reducing the ink on the image by stamping off on scratch paper. 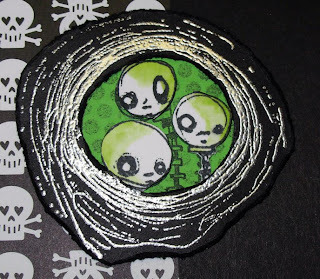 I stamped the image a third time, onto white cardstock, this time cutting out their sweet little heads only and giving some ghoulish shadow to add dimension with Copic Markers and a Blender Pen. The Silver and black circle and the head images were then mounted onto the green background with dimensionals. 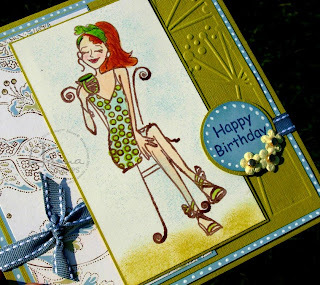 All Cardstock and Designer Paper is from Stampin' Up! 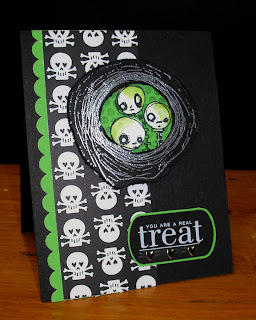 I finished the card by adding a Halloween Rub on Sentiment, also from SU! and three small heart brads from Making Memories. September is a month to celebrate with Hanna Stamps! Can you believe that Hanna Stamps will be one year old in October!!! This year has just flown by. September is going to be a month of surprises, challenges and give aways. Starting Sept 1st through and including Oct 1st until midnight, you will have a chance to win a Copic Air Compressor, or a $200 shopping spread in the Hanna Stamps store. For every $50 you spend, your name will go into a drawing to win one of these gifts. During our release party on Thursday night Oct 2nd, we will video tape Hanna picking the winning name out of a jar. The lucky winner will have their choice of the Copic Air Compressor, or the $200 shopping spree. We are going to have weekly give a aways during the entire month of Sept. So stay tuned here or on the Design teams blogs for these great prize give a aways! This card is made with images from the new cat set. There are some sweet sweet images in this one. I love the birdcage. I coloured the main images with Copic markers, drew in the floor and baseboards and created the wall treatment with Olive and Saffron ink, using a foam sponge. I used PRISM Paper....Tawny Medium as my base and Spring Willow Dark as an accent. The DP is from Heidi Grace Designs. Join us This Thursday evening in the Hanna Member Forum for our release party. It is always a blast...........lots of laughs, more sneak peeks and some fun challenge!!! !